Z-Frame® technology to create a durable and strong chassis. Dressing room and gooseneck area insulated, standard NOT extra! Z-Frame® tubular head dividers to create more air flow and less stress on your horses. SafeBump Roof® and SafeKick® Wall Systems to keep your horses protected. Fully insulated dressing room, YUP. It's standard. A convenient walk thru door from the dress to the horse area. Z-Frame tubular head dividers to create more air flow and less stress on your horses. 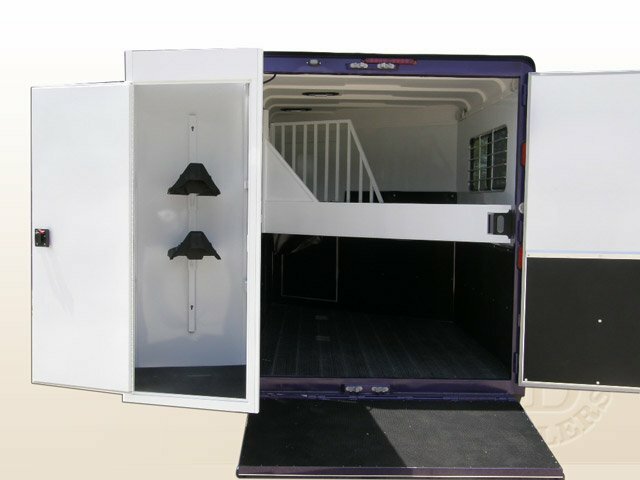 Show day "box stall" with side ramp and loading door. There’s nothing like a rejuvenating nap half way through a long day of showing. Our gooseneck horse trailers combine the convenience of mobile sleeping quarters with top horse safety features. You’ll get the ultimate package! Double D’s Gooseneck horse trailers for sale are not only structurally sound and designed for your horses’ safety, they are also sold at a factory direct value price. Is a Gooseneck Horse Trailer Right for You? Do you want a horse trailer sleeping quarters? Spending hours or days at a horseshow can be exhausting. One of the top advantages of a gooseneck trailer is the useful space that overhangs your truck bed. This ‘gooseneck’ space is the perfect place to take a power nap or spend the entire night to avoid the expense of a hotel. During camping trips, you can ditch the tent and stay close to your horses throughout the night. How many horses will you haul? Determining how many horses you need to haul in your new trailer is vital information. If you only need to trailer one or two, then a bumper pull horse trailer may be a good fit for you behind an adequately equipped tow vehicle. If more horses make you merrier, then explore our gooseneck options. What are your tow vehicle capabilities? If you are planning to use your current tow vehicle, you’ll need to determine how much weight it can safely haul. Ideally you would want to purchase the trailer first and purchase a new tow vehicle afterwards to safely handle the load. However, this is not always possible. If you are restricted to your current vehicle, then make sure it is able to handle a gooseneck trailer’s higher tow rating requirements. NOTE: Under no circumstances should you exceed the manufacturer's rated tow capacity of your vehicle. If you are confused or unsure, ask a specialist at Double D Trailers for help. Learn more about our Bumper Pull Horse Trailers and Living Quarters Horse Trailers. Want to know what sets us apart from the competition? Check it out! V-Style Aerodynamic Gooseneck: This design provides a greater turning radius behind your tow vehicle and increased gas mileage. Never purchase a gooseneck trailer that has a flat front as you may run the risk of damage to your truck in tight turning situations. Returning home with the back glass of your truck shattered can put a damper on what should have been a fun trip. Gooseneck Clearance: Have you ever seen a Gooseneck Horse Trailer being towed with the front end jacked up? Yikes! Not only will your friends talk about you behind your back, but it can cause uneven tire wear and a bumpy ride for you and your horses. At Double D Trailers, we insure you have adequate clearance over the tailgate of your truck so the trailer will tow level. Plus, this will help avoid crushing your truck's side panel on uneven terrain. Custom Designed Trailers: Each of our horse trailers is made to order. You can customize the design to fit your specific horses, add special features, or remove items that you won’t need. These customizations include things like increased head room over the sleeping area or your choice of exterior graphics and colors. 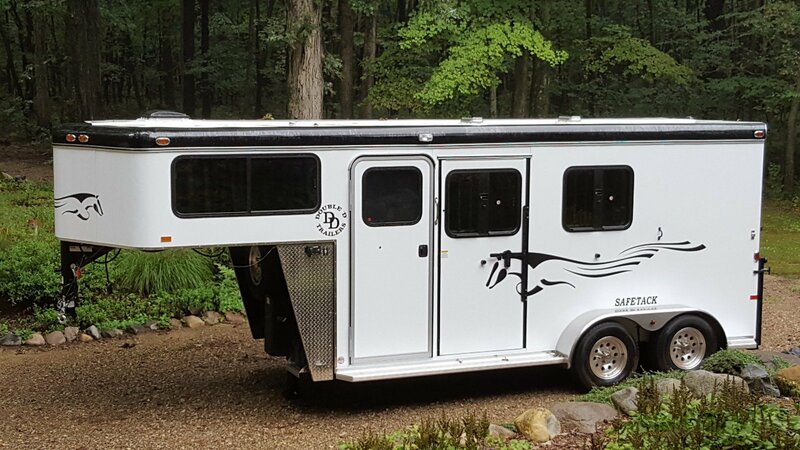 Make the trailer one of a kind to match you and your horses’ personalities. Nationwide Flat Rate Delivery: Don’t worry if you don’t live close to our manufacturing facilities. We won’t make you drive cross country to pick up your finished trailer. 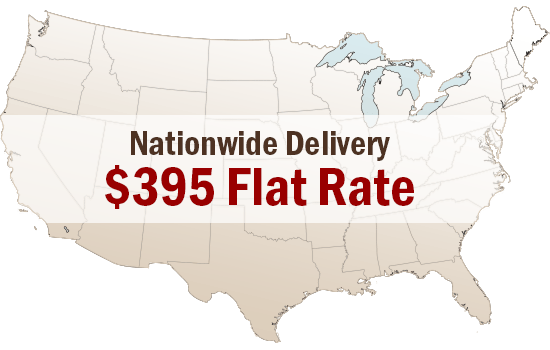 We have flat rate delivery anywhere in the country. Plus, we can arrange for delivery if you live in Canada or Australia. Top Safety Features: The SafeTack design is just one of our many innovative safety features. We put you and your horses’ safety above everything else. Check out information on features like Z-Frame, Rumber flooring, SafeKick, SafeBump, and how we create a ‘horse-friendly’ environment inside the trailer. Factory Direct Pricing: Get more ‘bang for your buck’ with our custom made horse trailers. Buying a horse trailer online is easy. Learn more about the benefits. Expert Advice: Do you have questions about buying a horse trailer or choosing the best materials? Do you need help determining the hauling capacity of your tow vehicle and hitch? Just ask us! We’re glad to help. The sleeping quarters at the front of your gooseneck trailer will become a shaded retreat on those long and hot days at the show. Stock your area with cool beverages, a comfy mattress and supplies to get you through your day. As with the rest of your new trailer, this private dressing room is completely customizable. Many choose to add increased head room over the gooseneck sleeping area. You can also add custom clothing hooks, storage compartments, or wall grid organizer panels to keep your equipment organized and clean. If camping is your thing, you will love using the gooseneck area as a home away from home. You can leave the leaky tent at home and use the sleeping quarters for overnight trips. 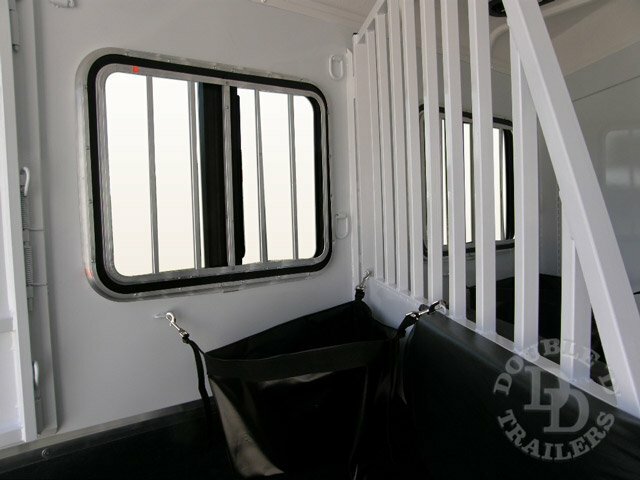 An interior access door back to the horse area will allow you to easily check on your horses. Stay cool with an overhead powered roof vent that will create a pleasant breeze. Add an extendable awning to the side of your trailer to create a shaded area to enjoy the day. Oftentimes, it’s the ‘little’ things that make the biggest difference. From hitch to bumper, we’ve looked at every detail to make it safe, easy to use, and durable. Here are just a few of those little details that help us create a higher standard for horse trailers. 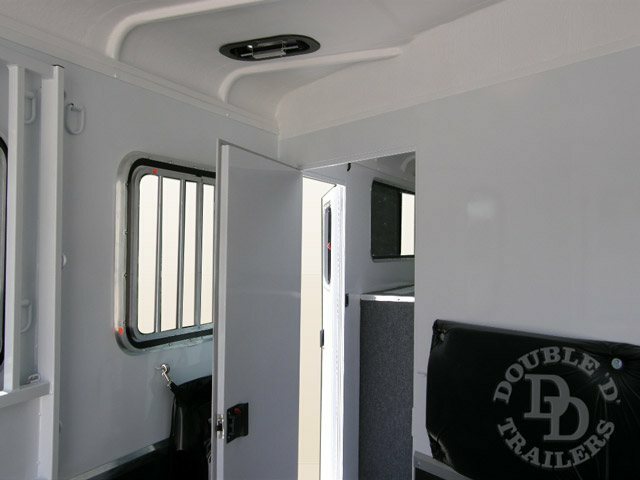 “Horse Friendly” Interior – No horse likes a hot and dark trailer. That’s why we’ve painted the interior of the trailer white to reduce reflected heat. We maximized air flow with large windows and tubular head dividers. A fully insulated trailer and ceiling help control the temperature to prevent excess sweating and dehydration. Z-Frame Technology – Brittle aluminum horse trailers are not strong enough to withstand the force of an accident. They crumple like an old soda can. Our patented Z-Frame design uses a special zinc alloy to provide superior strength in a lightweight design. The walls of your new trailer are made of rivet-free 16-guage galvalite that is 5 times stronger than 0.04 weight aluminum. Overall, you’ll get a lightweight trailer that is stronger than aluminum and provides the same durability. Easy Window Latches – We’ve moved the latching mechanism on the trailer windows to a lower position so they can be more easily reached. Self-Watering Tank - Add a self-watering tank system to your trailer so your horses can stay hydrated throughout the trip. On-Board Cameras – Do you want to keep an eye on your horses during the trip? Add an on-board camera so you can watch them while you travel. No Rattle Interior – We’ve secured all loose components inside the trailer to cut down on noise and stress for the horses. Tail Lights – The trailer’s rear tail lights have been moved to a higher position for maximum visibility for following traffic. Easy Lift Ramps – You won’t strain your back lifting our spring-assisted ramps. Read more Double D Trailer reviews here. All of our Gooseneck Horse Trailers come with a standard set of unique features. Our customers – and their horses – appreciate that we put so much emphasis on safety and comfort. With our gooseneck horse trailers for sale, you’ll be able to find the right model to safely and comfortably transport your horses and yourself. Step 1: Submit an Online Customization Request – Use the drop down menus at the top of this page to check out all of our gooseneck horse trailer models. Click ‘View and Customize’ on a particular model to learn more about its features. Then click ‘Customize Your Trailer’ to begin building your own personal design. It’s easy to select features on your wish list and few the estimated cost to stay within a budget. Submit the order with a few details about yourself and you’re on your way to a brand new trailer! Step 2: Our design team will get back to you with a Detailed Pricing Estimate to identify any potential problems with your submission. Step 3: At this point, you will begin a Detailed Back-and-Forth Conversation with our experts to refine the design and establish final pricing. We can also discuss your truck’s towing capacity to make sure you can safely haul the trailer. 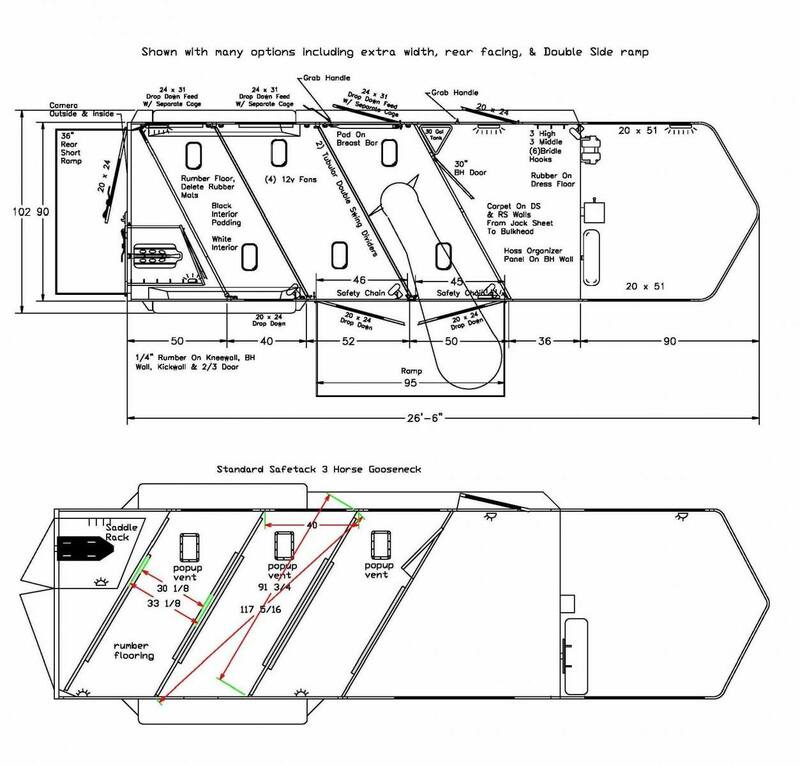 Step 4: Next, you will receive a detailed CAD Drawing that will act as the blueprint for the trailer construction. Step 5: If everything looks good, you can give your Final Approval and Construction Can Begin. The trailer is now officially on order. Step 6: All of the Final Touches can be discussed after the trailer construction has started. This includes things like selecting final color choices and finishes that make your trailer one of a kind. One of the most exciting times for buyers is being connected with their delivery man. He will drive your trailer right to your home for a flat rate delivery fee. You get to give your final ‘thumbs up’ before the delivery man leaves. Then it’s time to load up the horses and start having fun! Click “See Pricing” above to get started looking our gooseneck horse trailers for sale. 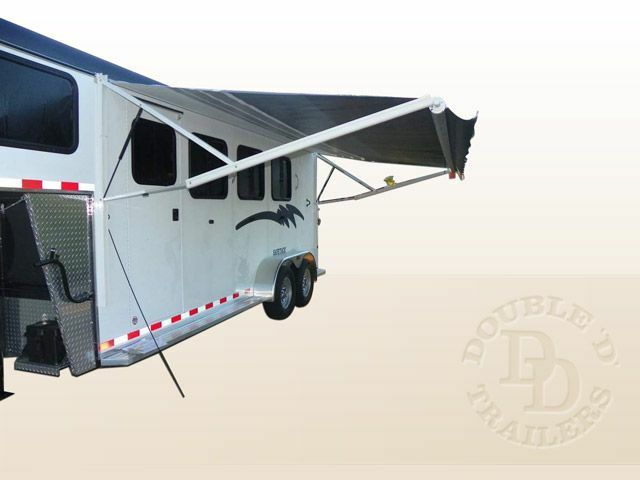 Check out this video of a 3 horse gooseneck horse trailer. Download this FREE printable pamphlet with more information about our gooseneck horse trailers for sale.